After sixteen Rounds of Swiss, including six rounds of draft, we are looking at one of the most star-studded Top8 lineups in years, including two Hall of Fame members in LSV and Shuhei, and a plethora of accomplished players at the highest levels of the game. 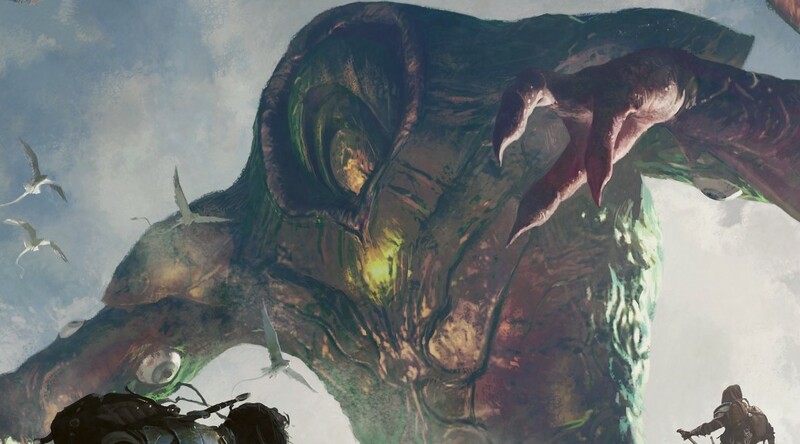 Despite the top tier talent on display, the community concern is high after bannings of Splinter Twin and Summer Bloom seem to have yielded a metagame fully dominated by various Eldrazi decks relying on their broken lands (Eye of Ugin and Eldrazi Temple) to power out threats ahead of curve. Two Affinity decks did make it into the Top 8, as a fast and powerful archetype that can sometimes outrace even the Eldrazi, but the health of the format is still called into question. Folks have been disrespecting the UR Eldrazi deck all weekend, but the stats don’t lie. This deck went 19-1 on Day 1 across 4 different pilots, and did nearly as well on Day 2. Across the first three games of a best-of-5 series vs. Hall of Fame member Shuhei Nakumura, however, both Eldrazi Skyspawner and Drowner of Hope go toe to toe with one of the best players in the world, playing a CFB team designed Eldrazi deck, and manage to take Tao up to 2-1. The spikes on cards from the UR Eldrazi deck were slow to take off, as many people likely had trouble believing that this pile of former limited cards were actually worth playing in Modern, but the tide had turned by Saturday evening, with foil copies of cards like Drowner of Hope and Eldrazi Obligator, drying up almost entirely. In Game 4 Tao gets off to a fast start with two Eldrazi Mimic on Turn 1. On Turn 3, a Reality Smasher from Tao, prompts a Dismember, but the Mimics still get in. An Oblivion Sower from Shuhei seemingly stablizes the board but a timely Eldrazi Obligator clears out all defense and Tao moves on to the semi-finals against the Hall of Famer! LSV takes the first two games. In Game 3 Maynard gets a fast start, but LSV has a Ratchet Bomb to blunt the early attacks. A flurry of exchanges leaves one robot left in the air a few turns later, and Maynard gets a game. In Game 4, LSV has to mulligan to 5 to find a satisfactory hand. Maynard gets off to a fast start with Inkmoth Nexus, two Signal Pests and a Memnite. LSV gets his third land into play on Turn 3 however, and LSV manages a Reality Smasher that swings. Master of Etherium from Maynard puts LSV on the back foot, but he answers with Dismember and holds back his Smasher to block. The defensive plan is dashed however, as Maynard squeezes through enough damage in the air to take the match to 2-2. LSV boards in his Chalice of the Voids on the play, and finds a hand with one to use on zero, along with a Pithing Needle and a Dismember. Maynard goes to six cards and dispatches an early Chalice with Ancient Grudge. LSV needs to find a land to get more of his hand on the table. A land off the top a couple of turns later, and LSV gets a Thought Knot Seer to clear a Master out of Maynard’s hand, pumps his Mimic to 4/4 and swings with it alongside an Endless One. A few exchanges later, LSV is forced to trade a Blinkmoth for an Inkmoth from Maynard, with two Reality Smashers stuck in hand. With one Matter Reshaper on the board and another off the top, LSV applies enough pressure, finding the needed land the following turn and putting away the match to advance. Patrick takes Game 1 in quick fashion with a blistering Affinity draw. In Game 2 an early Whipflare from Dickmann clears the board of Mimic and Obligator, and Brown is forced to lean on a Hurkyl’s Recall to slow down the Affinity aggression. Another copy of the same blue instant does similar work, and a Chalice of the Void on one traps a pile of cards in Dickmann’s hand. Even still, the Affinity player manages to drop two Ornithopters and a Steel Overseer, and takes Game 2 through a Reality Smasher that joined the party too late. Patrick Dickmann accelerates just as fast in Game 3, and stuck on lands for a couple of turns too long, Brown falls in three games. LePore takes Game 1 on the back of Drowner of Hope, a card that continues to exceed expectations in the context of these grindy ground battle based games. In Game 2, an early Ghost Quarter from Floch on LePore’s Eye of Ugin, forces Frank to drop an Urborg that enables an Oblivion Sower from Floch, and Frank elects to move on to the next game, tied at one a piece. In Game 3 a huge board stall ends up swinging in Flochs’ favor, and he moves up a game, leading 2-1 in the match. The fourth game finishes quickly, with early pressure from LePore going unanswered soon enough to save Floch, and the players move to the tie breaking game. Game 5 is a tense back and forth, but Floch manages to come out on top and moves on the Top 4 where we have one Affinity deck and three Eldrazi decks remaining. Tao explodes out the gate with two Mimics and a 2/2 Endless One on Turn 1, demonstrating the potential explosiveness in the Eldrazi decks’ ability to fracture the usual mana curve of Modern decks. LSV manages a Dismember, but is quickly run over, losing Game 1 in less than five minutes. In Game 2 Tao is again manage to present an aggressive series of attacks, but only after LSV has knocked him down to four life. Forced to bet on a bad draw from his opponent on the next turn Tao, attacks with everything, but dies to a top decked Reality Smasher from LSV. In Game 3 Tao seems poised to take the game with a significant on board advantage, but a masterful sequence of defensive plays from LSV baits Tao into an unsuccessful attack that leaves him wide open to the crack back. LSV takes the lead 2-1, looking to close out the match in the next game. Eldrazi Obligator closes out Game 4 quickly in favor of Tao however, and forces a final game to decide our victor. Between games Tao receives a warning on the basis that he did not actually have the mana to activate the Threaten ability on Obligator. LSV then mulligans twice looking for a competitive hand, and the stage is set for an anti-climatic final game. Not able to find the defense he needed to get back in the game, LSV falls and we find Tao in position to battle for the top slot having defeated back-to-back Magic Hall of Famers. In Game 1, Master of Etherium is back on camera as a renewed Affinity staple in this meta. Floch is forced to play defensively in the face of a top tier draw from Dickmann, finds himself pinched on mana on a key turn, and Dickmann is able to present lethal to take the first game. In Game 2, Dickmann stalls out with two Ornithopters in hand, and three Signal Pests on board, facing down an active Eye of Ugin that provides everything Floch needs to get take the game and even things up at one a piece. Game 3 ends up hinging on a well timed Gut Shot on a Vault Skirge preventing the use of SpringLeaf Drum to cast a second, and Dickmann is Reality Smashed a turn or two later. Dissatisfied with his first hand, Dickmann sends it back looking for a grip that can bring the pain. Floch takes off fast however, following up a Turn 1 Mimic with a Turn 2 Reality Smasher off of Simian Spirit Guide mana. Dickmann fails to pull out of the hole, and Floch takes the match 3-1, knocking the remaining non-Eldrazi deck out of the tournament. So it’s an all-Eldrazi final after all. In Game 1 Ivan Floch finds three Reality Smashers before Tao can really get established on board, and the game is quickly won by the colorless Eldrazi deck pilot. To start Game 2, Floch has to mulligan to find sufficient action, and despite trying to stabalize on Oblivion Sower, an Eldrazi Obligator from Tao demonstrates yet again how well tuned the UR build is for Eldrazi mirror matches. Tao also takes Game 3 with a well-timed Thought-Knot Seer knocking out a key Reality Smasher to pressure Floch into concession. In the final game, Tao gets to start with Gemstone Cavern in play, dropping an Eldrazi Mimic and an Eldrazi Skyspawner on Turn 1. Floch, mulliganing to 5 cards, is unable to gain much steam. Turn 2 has Tao dropping Vile Aggregate, and attacking for seven damage with Mimic and Skyspawner. One attack later, Floch is top decking to hang on and can’t find an answer. Tao is our champion on UR Eldrazi, using Eldrazi Skyspawner and Drowner of Hope to win a Modern (!) Pro Tour. Wrap-up: Look for Eldrazi staples to hit close to peak this week. It’s a great time to get out, since the ban potential of the deck is high in the next 3-12 months and gains are already significant. Death’s Shadow, Infect, Burn and Affinity cards should do well this month as well, since they represent the decks that have the best chance of keeping pace with this utterly broken land base. How many colored spells in the top 8?? This format goes against everything that Magic was designed. They need to fix it. Fast. Has this done anything to devalue previous Modern staples – Jace, Vryn’s Prodigy, Blood Moon, Kolaghan’s Command, Fulminator Mage, etc., since none of those saw much if any play in the top tier? So does UR Eldrazi immediately consume modern as well? 39 of 60 cards are all in the most recent block. Shuffle the land base around, replace dismember with roast and it’s literally the same deck with a slightly slower land base in a slightly slower format. Second quick question. Do you think an eye of Ugin ban could happen and this deck remain tier two in modern or is there just no way? Thanks for the article, good stuff. The main reason why the Eldrazi decks are so powerful in Modern is the fast mana and the very predictable meta in my opinion. Without Eye of Ugin and Eldrazi Temple the deck isn’t nearly as explosive. It’s not slightly slower, it’s a lot slower. And without Chalice of the Void devaluing a large amount of spells (so many one mana spells in Modern, and it even works as early as turn 1 in combination with Simian Spirit Guide) it is much easier to react to it. I can’t imagine Eldrazi decks will take over the next Standard GP like the Eldrazi decks did during the Modern Pro Tour. Format is just hot flaming trash.